With Daylight Savings Time now upon us, the days are getting longer. The temperature is also getting warmer. So, it’s time to think about the great outdoors. But, you don’t have to get away to experience it. You can do so in your own backyard – and it doesn’t have to cost a lot. HGTV has plenty of ideas for you. Firstly, gnomes have been done over-and-over again. They’re so common that many people don’t consider them interesting anymore. A fresh idea may be to add a colorful umbrella to your backyard table or a free-standing one nearby. Liven the place up a little. 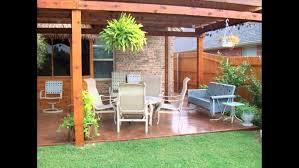 You can also add a little breathing space to your outdoor place. Get some small plants and place them around your outside’s common area. It not only adds a decorative feel to the eye. The oxygen the plants give off will help alleviate any breathing issues that come from hay fever. You can also add new cushions to your chairs or outdoor couch if you have one. If you have the craving to create your own pillow covering, your local arts & crafts or home store can certain aid you in your quest. They can also help you find small statues or even a small waterfall fixture to add some new scenery to your outdoor space. Adding these will surely become conversation pieces. The Powell Group is always here to help you beautify your space. Our team members are also here to answer any questions or concerns you may have.